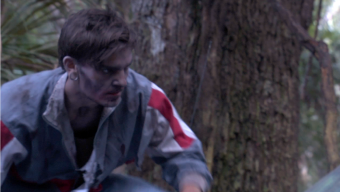 You will be totally immersed in Zombie Adventure. Zombie Adventure has you searching for Dr. Kline. Why? Because he has the antidote and you don't want to become a zombie, do you? At a certain point in the search, you'll find an armory where you will get a weapon (paintball marker). You will use that weapon to fight your way through zombie infested scenes. Zombie Adventure zombies are live actors (targets). You can survive but only if you shoot them in the head. There are two parts to this show. In the beginning you'll have to make your way through several scary scenes on your way to the armory. When you get to the armory, you'll get a weapon and from that point it's a really bad day to be a zombie.